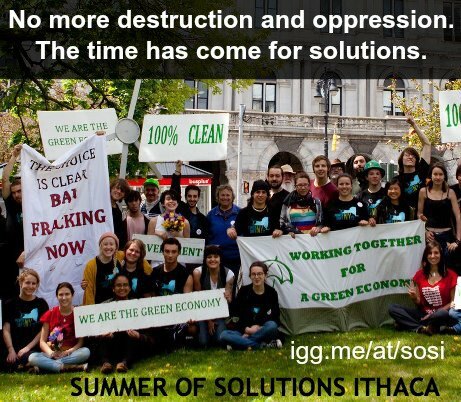 Summer of Solutions: Ithaca has hit the ground running from every angle. Program development and partnership work has succeeded tremendously in solidifying local allies, contributors, and educators, and in formulating program design for our 8-week program. Dynamic mechanisms of outreach have been employed to target potential participants, many of whom have gone on to apply to SoSI through our first round of applications. Additionally, we are very proud to announce that we have been awarded a $435 grant through Sustainable Tompkins, an organization that has been at the forefront of community organizing and sustainability in the area. Our next steps include fundraising veraciously, processing our second round of applicants, continuing to reach out to local partners, and fine-tuning program details. Continue checking in for more exciting updates! This entry was posted in Local Programs, Summer of Solutions and tagged Indiegogo, Ithaca by caklein. Bookmark the permalink. No one reads the words you want them to. So write them for yourself.